Metro Bank chairman Vernon Hill said he put the bank's success down to the retail experience it provided for its customers. 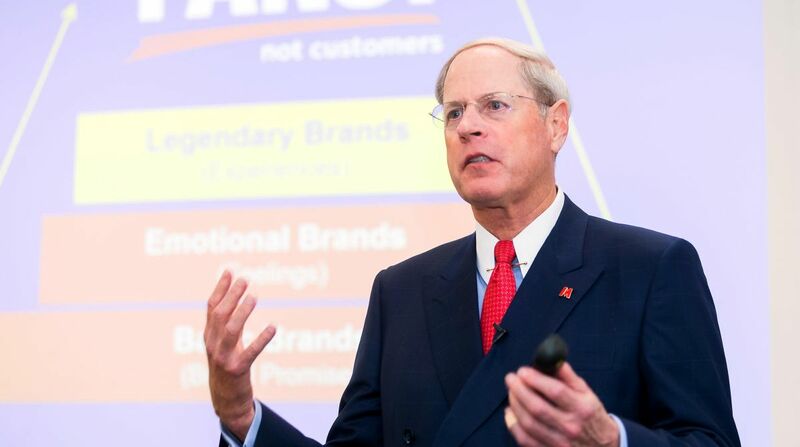 This year's series of Kingston University industry-respected Strategy into Practice seminars has launched with American entrepreneur and chairman of Metro Bank Vernon Hill speaking to a packed lecture theatre at Kingston Business School. Mr Hill told the audience of students, staff, alumni and local business people that when he had founded Metro Bank in 2010 it had been Britain's first new high street bank for more than 100 years. "It now boasts 66 stores and assets of more than £20 billion," he said. "Building a growth company, or not-for-profit, in a slow growth world, as I did, is all about having fans rather than customers." 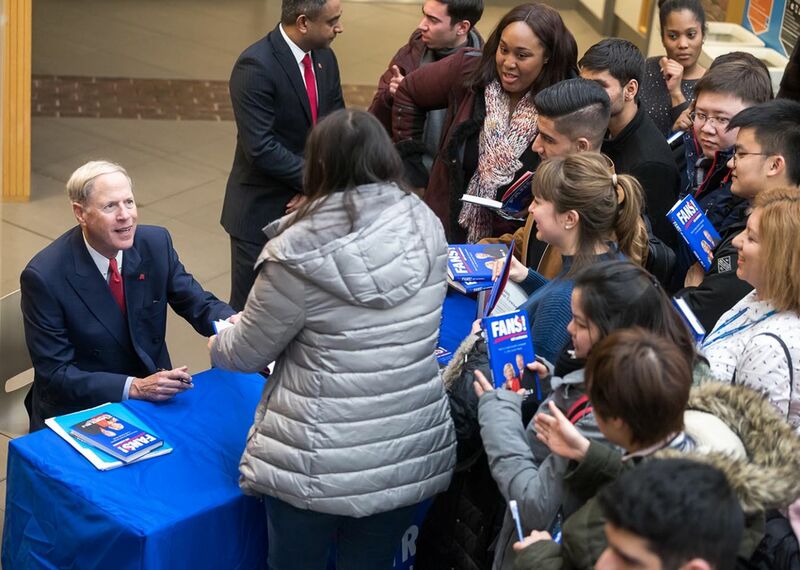 Mr Hill – who is also the founder, former chairman, president and CEO of Commerce Bancorp in New Jersey and chairman of Pet Plan North America – began his talk by asking who in the audience wanted to be rich, or a star. Everyone excelled at something and superstars were just individuals who understood their unique talents, he said. "They match their careers to their gifts," he added. "This is why top chefs taste food and great musicians hear music differently to the rest of us." 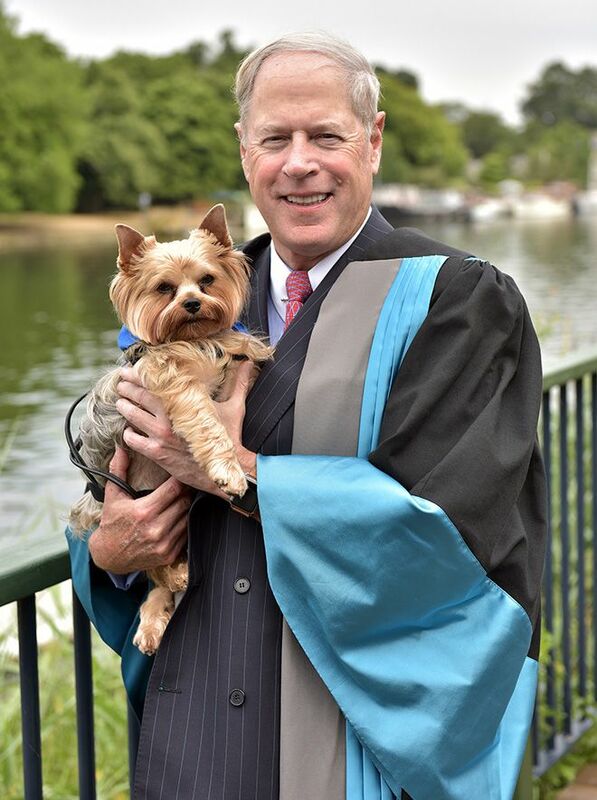 Mr Hill with his dog Duffy - the face of Metro Bank - on picking up his Kingston University honorary doctorate last summer.Last summer, the University recognised Mr Hill with the award of an honorary doctorate. He attended the ceremony alongside his dog, Duffy, who also featured prominently in his seminar talk and who, Mr Hill said, played a key role in the Metro Bank brand. "My dog is the best-known dog in Britain and we have a saying at Metro that 'dogs rule', because other banks won't let you bring dogs in whereas we welcome them," he explained. "Customers take that to mean, 'if the bank loves my dog, it must love me'." Mr Hill outlined the journey taken to build a brand from scratch, starting from a basic brand promise, through to prompting an emotional response and finishing by becoming a legendary brand. "When you reach that status, the customer and the brand become one and we call those customers 'fans' – which is what my book is about," he said. "Great brands are built by creating a value-added model that is different to your competitors." Recounting why he had decided to create a new bank in the United Kingdom, Mr Hill said Metro was not trying to improve British banks but was actually mounting a revolution, changing everything about the way banking was done in Britain. "The banks here are 50 years behind the world, burdened by the past and their awful IT which is only one step above a quill," he asserted. "Famously, the press here says that Brits are more likely to get divorced that to switch banks, but 1.6 million people have switched to Metro Bank and we have the highest net promoter score in the country." Net promoter scores were how you measured your brand value in terms of the percentage of your current customers who would recommend you to a friend, he said, and banks featured low down in the rankings. "I never saw a negative net promoter score till I came to this country – it means their customers are actually telling their friends to leave," he said. "Metro Bank is at the top with a net promoter score of 82 and currently sits between Amazon at 77 and Apple at 89 in the overall sector scores." Two major components of Metro's success were that it was a retailer that just so happened to be a bank and that it had swiftly recognised that customers would trade lower rates for a better retail experience, Mr Hill explained. "Our promise to our customers is to surprise and delight them, deliver unlimited convenience, have no stupid bank rules and have satisfaction guaranteed," he said. "It's not about the price, the product or the location, it's all about the experience." Mr Hill finished with a suggestion to the students in the audience. "Be all you can be," he said. 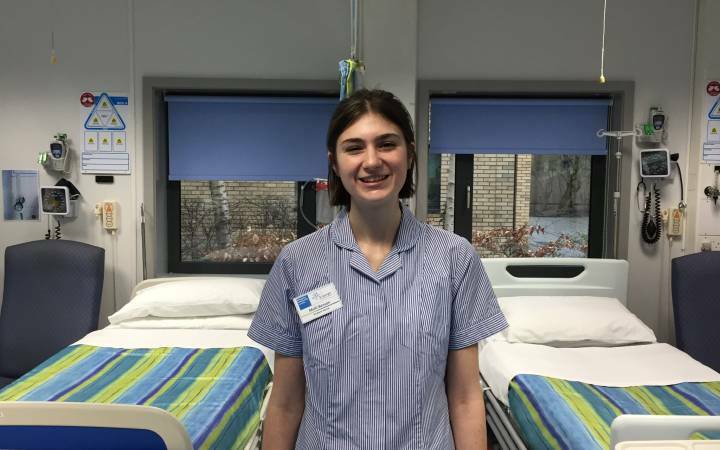 "Choose a field which you love and where you want to go to work and go be a star." MBA graduate Declan Burke (right) and 3rd-year business management student Anna Magnusson at the event. Kingston Business School MBA graduate Declan Burke said the way Vernon Hill had described his path to success had been inspirational. 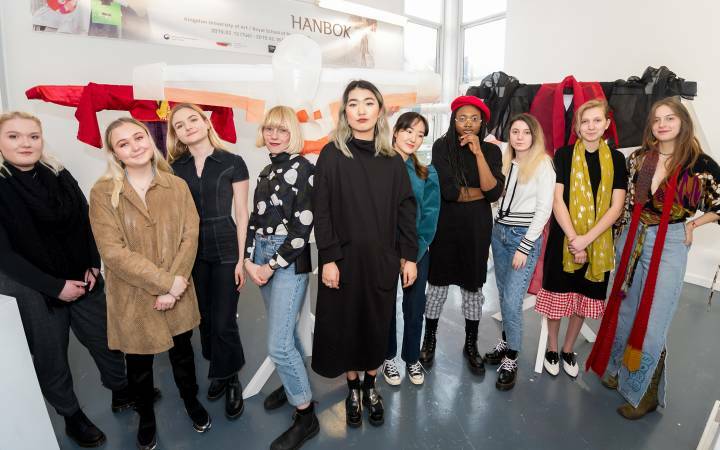 "His take on the need for companies to stand out to the point where customers clearly see value being added, particularly resonated with me," Declan added. 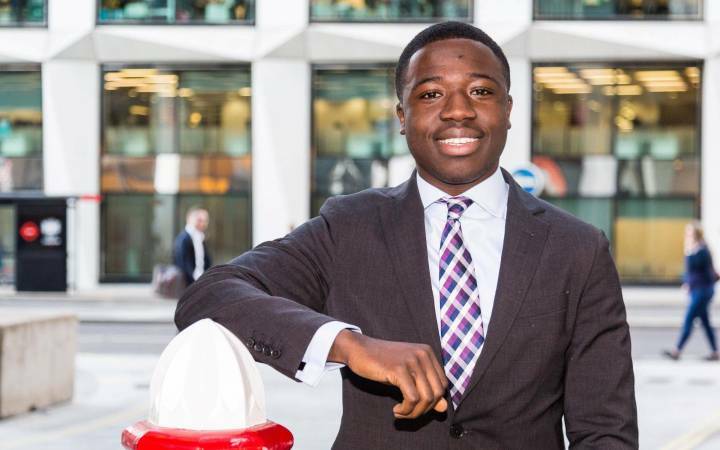 "He has built Metro Bank up from scratch to where it is today based on his belief in everything being about the brand – from who you are to what customers can expect from you." Third-year BSc (Hons) Business Management (Finance) with Business Experience student Anna Magnusson agreed with Declan. "Mr Hill emphasised the importance of having a business model that everyone in the company could believe in," she said. 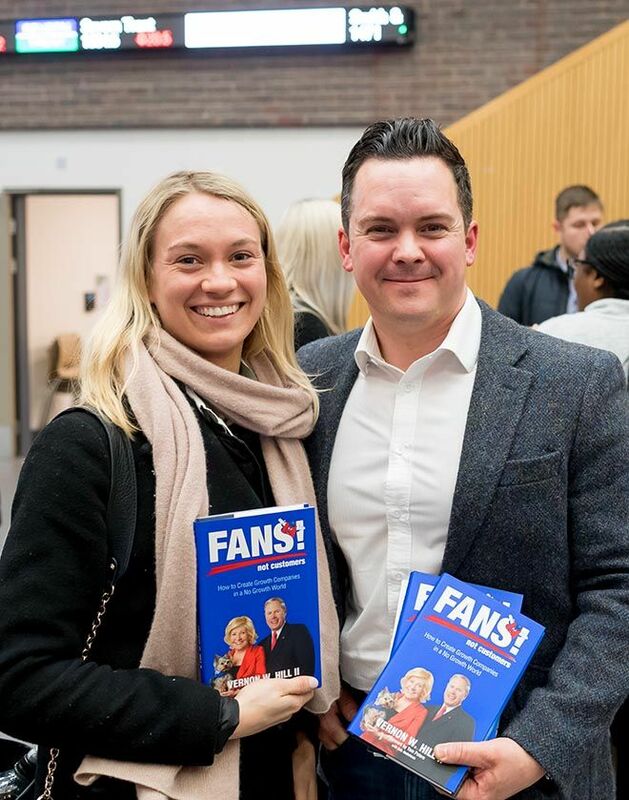 The talk was followed by networking in the Business School atrium where eager students and staff queued up to ask Mr Hill to sign copies of the latest revised edition of his book Fans! Not Customers: How to Create Growth Companies in a No Growth World published by Profile Books. Kingston Business School's premium Strategy into Practice seminar series is designed to give attendees the opportunity to gain valuable business insight from industry leaders and heads of not-for-profit corporations. The seminars provide first-hand accounts from top executives on strategic challenges in their industry and how they have steered their organisations to compete successfully. 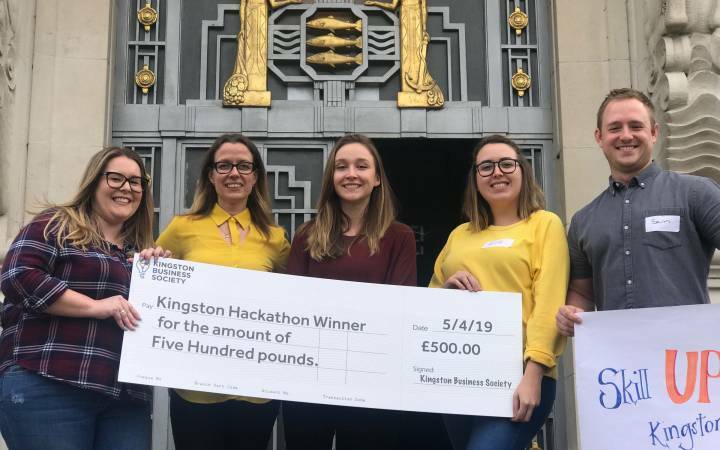 Attendees have the opportunity to ask questions and network after each session with the speaker, other local business leaders and academic staff from Kingston Business School. Find out more about the Strategy into Business seminars and studying business management at Kingston University. After his talk, many attendees at the packed seminar were keen to ask Vernon Hill to sign their copies of his book.